Proud of our armed forces? Looking to write to soldiers? Want to stay in touch with back home? Join us for free now. Oops! We think you may have misspelled your email address . 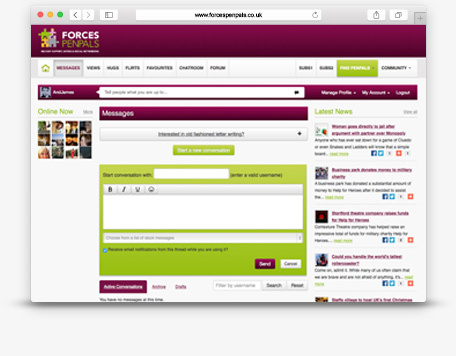 ForcesPenpals.co.uk is the top military support, dating and social networking website for the UK Armed Forces and their supporters. Join our Community to Support, Message, Chat, Write to, and Date our Armed Forces. "One day while reading through the daily 10-20 messages I received, there was a message from a lovely looking young lady. Her message was lovely, kind and very very funny. I couldnt stop thinking about how good her message had made me feel. I messaged back and it wasnt long before we were messaging each other up to 40 times a day!" Join Forces Penpals For Free! Cookies are disabled on this browser and they are required for the use of this website.